A construction crew in China working at Xinyuyu Middle School in Dayu County, in the country’s Jiangxi Province, have accidentally discovered dozens of Dinosaur eggs that are about 130 million years old. 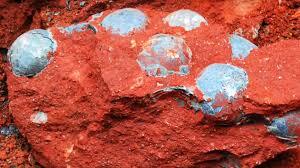 These sort of discoveries of fossils are often accidental, but in this particular case, the eggs also survived explosive blasts.. The crew was using explosives to clear the site of large boulders when they noticed oval-shaped stone lumps and black-colored fragments in the boulder they had just blasted. The workers stopped working upon the discovery and contacted the police, who contacted the local museum authorities. The museum later confirmed that the stones were indeed dinosaur eggs and that the black material, roughly 2 millimeters thick, was the egg shell. Between 20 and 30 eggs were recovered from the site, which seems to have been a dinosaur hotbed, a suitable place for dinosaurs to reproduce.